The TV towers are heavily fortified, but my guide knew one of the guards and we were able to stop at the peak and get a look out at the dusty city of Kabul. Clean air? Not here. We did not stay long—there were several others places to see and our next stop was perhaps the most fascinating. 10 miles outside the city center sits the Darul Aman Palace, built in the 1920s by King Amanullah Khan as part of his efforts to modernize Afghanistan. Fire destroyed the inside in 1969 and the Soviets damaged the outside during their 1978 invasion. During the 1990s Civil war, rival Mujahideen factions fought for control of the palace and ended up destroying it. 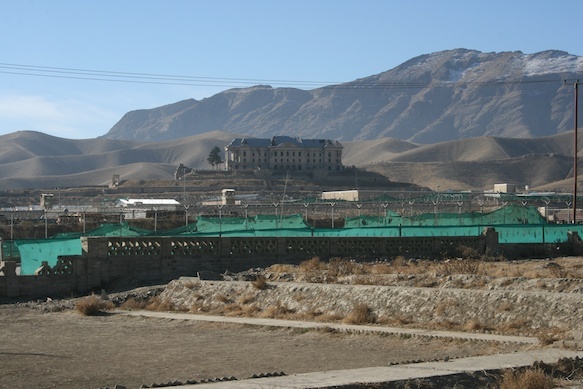 In 2005, plans were made to rebuild the palace and make it home to Afghanistan’s parliament, but like many public works projects the money never came and the palace sits in ruins. Off in the distance is the Tajbeg Palace built for King Amanullah Khan’s wife, Queen Soraya. The Tajbeg Palace housed the Soviet Army during the occupation but also stands in ruins today. Not on the short list of places to visit for us, but the insights you provide are most interesting! Speechless. Thank you for sharing Matthew. So wild! Hard to believe that pictures are from 2013…just so surreal.